Fall has come—whump!—to the Northwest. The maples and walnuts are at their showiest and our big sweetgums (still with a stubborn cloak of summer green) are flinging their branches about in the easterlies that bring us our cold fronts. The rain is forecast to begin tonight and continue until… no one knows. My weather calendar shows nothing but drear droplets, on and on. We have knuckled under and turned on the heat, and the vent that is pleasantly blowing warmth up my trouser cuffs is also blowing cat hair into my glass of cider. Yes, the Knitting Weather has arrived again. It is October, so I am knitting socks (for Socktoberfest, ye muggles, a knitter’s official license to knit as many socks as she pleases, not that she wouldn’t be knitting them anyway, which I suspect is thoroughly equivalent to the situation of the Germans and their merry beer-drinking). I am knitting extraordinarily glorious socks of Teeswater wool. I had to look up the Teeswater sheep, never having heard of it. I discovered that a Teeswater ewe was the founding mother of the Wensleydale breed, of which I have heard (and knit, with excellent results). That Teeswater mama passed on her lustrous locks, which are durable, sleek, and soft. These socks will have their own post soon, as will the Arch-Shaped/Lenore socks I just finished and mailed to Marika. Today I want to tell you instead about some schemes for the future. These lovelies are precious cargo from my trip up to the islands. They come from Lopez Island sheep via Island Fibers studio, the work of two women with an enviable workshop nestled at the edge of the woods. A big garage is loaded with bags of fleece waiting to be washed and primped and sent away for spinning. 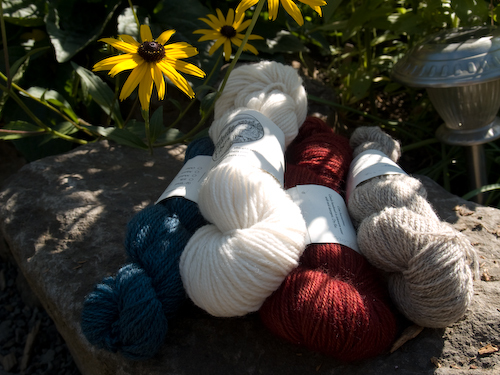 They have a dyeworks where Debbie works her magic on the natural white and gray heathered wool, producing a luscious range of come-hither colors. Maxine gave us a tour of the weaving room, where Debbie was at work on a big rug, and introduced us to the end products you see above and all their beautiful cousins. The plump white fluffy one on top is a woolen-spun Rambouillet, light as a soufflé and soft as a mole’s armpit (my grandfather’s saying, which I must remember to use more often). The blue one is a sport-weight 2-ply, dyed on the natural gray of the sheep from local farmer Sally Bill’s flock. Maxine explained that this flock began as a Romney-Lincoln cross, but has since had visiting rams of many backgrounds, always with an eye to improving the fleece. She calls them Sally Bill sheep. The gray skein is Sally Bill wool blended with 30% alpaca; I can feel just a little more weight to it and suspect it will drape a tiny bit more. The rusty red skein is a worsted-spun 3-ply wool prepared at a mill in New Mexico. It looks ready to shout a stitch pattern from the rooftops and I can’t wait to give it a whirl. In these little skeins are the kernels of a grand idea. Formulating a grand idea is something like poaching an egg; I know that once I break it into the simmering water the exterior will go all to a wispy mess if I don’t very intently spoon it back around the yolk, and it takes composure and deftness to bring it off. 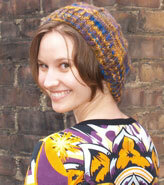 The yolk is this: a design collection for hand-knitting inspired by my home islands. The wispy mess? Just how many and which designs it’s feasible to include; the possibility of writing some vignettes (EZ would call them digressions), some personal geography; a timeline; tackling the book design myself. I know I’d like to feature local yarns, though probably not exclusively. Keeping the whole thing digital, at least for now, seems prudent, as does releasing the patterns for individual sale. A couple of patterns I haven’t released yet might be included (Mr. G’s new gansey, the Islander baby sweater), and I’ve got sketches for a number of others. I’m fairly sure that skein of Rambouillet wants to become a squooshy, cozy shawl-let; I’m excited to swatch the alpaca blend and the 3-ply as contenders for a long vest with twisted stitch motifs. More to come… I’ll be working on some swatches in the coming weeks! Oooh, how exciting a yolk that is, too! Very cool. I can’t wait to dive into your digressions and patterns! How exciting an idea! I wish it to become a handback, to be signed and loved over and over and not to be lost through computer glitches or other cyberspace oddities. What an exciting idea! I wish it to become a handback, to be signed and loved over and over and not to be lost through computer glitches or other cyberspace oddities. That’s a wonderful idea – I look forward to watching your progress! It sounds like the perfect project to nurture and develop through a Portland winter! I can’t wait to see what you come up with. That is such a great idea!! I can’t wait to see the finished items. Mmmmm. Lovely plan. If I can help with execution, you just whisper my way. This is an idea of epic proportion, and I am supportive in all ways. Happy to source local yarns etc on the Canadian side of our beloved islands…happy to test knit patterns…happy to contribute in ways that make sense. Good for you for taking this on. I’ve long aspired to design and digressions myself (had it in my mind’s eye for about 4 years) but have lacked the nerve…and the time. Oh yay! I think that’s a wonderful idea, and I’m very excited to see what comes of it. If you need test knitters, don’t hesitate to call on me. This sounds wonderful. I look forward to reading and knitting it. Please let me know if you find yourself in need of test knitters. Exciting! I can’t wait to see your poached-egg project take shape! I am so, so excited about your idea! (Perhaps I am biased, since I am considering doing a similar thing, but still). If you ever want to bounce ideas off someone, I’d be happy to be of service!